Researchers at Oak Ridge National Laboratory (ORNL), in collaboration with Argonne National Laboratory (ANL), Chevron Corporation, and Ford Motor Company, have developed a model to help deploy hydrogen refueling stations for fuel cell electric vehicles (FCEVs) more effectively. Fuel cell electric vehicles are an emerging technology that has the potential to increase our energy security and reduce air pollution. FCEVs look just like conventional cars, but they are fueled by hydrogen rather than gasoline or diesel. Fuel cell vehicles powered by pure hydrogen emit no tailpipe emissions, only heat and water. These vehicles are just now becoming available to consumers, but they still have a few obstacles to overcome before they can compete with petroleum-powered cars. One of these obstacles is fuel availability. Less than 40 hydrogen stations are open to the public in the United States, and most of these are in California. Therefore, a network of hydrogen fueling stations must be developed to meet consumer demand. Capital costs for developing a network of hydrogen stations are quite high, and it will be difficult to recover these costs in the early stages of development when hydrogen demand will be low. The fuel availability obstacle is somewhat compounded by the fact that gaseous hydrogen is not as energy dense as gasoline on a volumetric basis. Therefore, it must be stored in high-pressure storage tanks on board FCEVs to allow a driving range comparable to that of petroleum-powered cars. Storing hydrogen at higher pressures allows more of the fuel to be stored, increasing driving range and reducing refueling frequency. Providing hydrogen at higher pressures increases the capital cost of refueling stations. Therefore, it is important to determine the optimal delivered hydrogen pressure, or DHP, so that capital costs can be kept low while meeting consumers’ hydrogen refueling needs. The optimal pressure can depend on many factors such as vehicle fuel economy, refueling time, the number of refueling stations, and base hydrogen cost, and these factors evolve over time. This makes determining optimal DHP quite difficult. 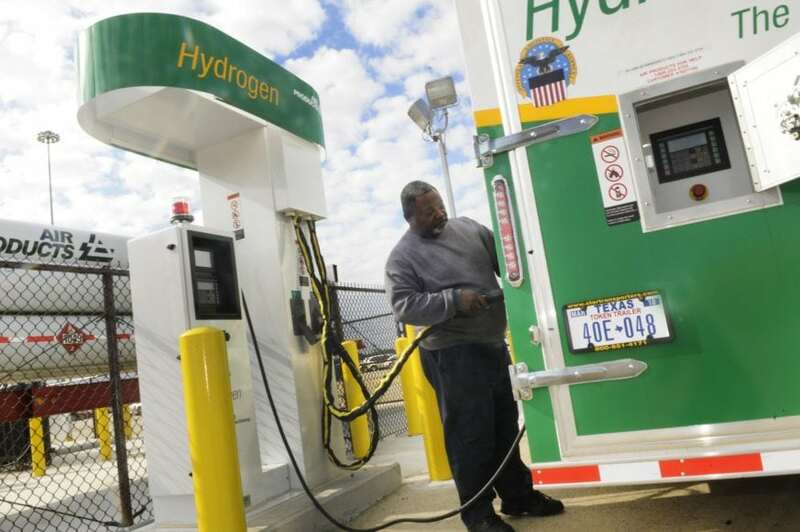 The U.S. Department of Energy’s Fuel Cell Technologies Office (FCTO) within the Office of Energy Efficiency and Renewable Energy has been funding early-stage research and development to complement the private sector roll-out of hydrogen stations. This includes research and development of complex tools and models to quantify the benefits of various scenarios and help guide future R&D. ORNL’s Transportation Energy Evolution Modeling (TEEM) Program and its collaborating partners have developed a model to determine the optimal delivered hydrogen pressure for refueling FCEV under prevailing conditions. The Hydrogen Optimal Pressure (HOP) model is a flexible tool that can be used to analyze how hydrogen station profitability can be affected by delivered hydrogen pressure, station size, utilization, hydrogen pricing, and market penetration of FCEVs. The research team used the HOP model to (1) determine the optimal DHP by considering both infrastructure (supply) and consumer (demand) factors and (2) conduct case studies to provide useful insights into DHP strategies that reduce infrastructure cost and increase market acceptance. The study considered two different station deployment strategies, a cluster strategy, and a region strategy. In a cluster strategy, stations are deployed in a small city or geographic area that is projected to have a high concentration of FCEV drivers. In a region strategy, stations are spread around a large region to benefit a large potential consumer base and provide greater station coverage. The study considered three different hydrogen storage pressures (350, 500, and 700 bar) and six different driver types based on commute distance and overall driving intensity. It also studied the evolution of DHP, and factors affecting DHP, over time. Optimal DHP is very sensitive to fuel availability, fuel economy, driving patterns, and consumer value of time. A DHP of 700 bar is a significantly better choice than 350 or 500 bar for the region strategy, regardless of fuel availability, FCEV adoption, driver type, fuel economy, or consumer value of time. However, a DHP of 350 or 500 bar can be the best choice in the cluster strategy for some driving patterns and time values. Even though a greater DHP can be more desirable for a cluster strategy under some circumstances, the urgency for pressure upgrades is much more obvious in a region strategy. The cluster strategy allows a small number of stations to provide a high level of refueling convenience, which compensates for the shorter driving range realized from lower pressure refueling. It also avoids the high cost of many underutilized stations in a region strategy during the early market. The appeal of a higher DHP, such as 700 bar or higher, is more obvious during the early market stages. This is because the number of hydrogen stations is limited and early FCEV adopters likely have a higher value of time, making them more willing to pay more for the increased driving range. The HOP model, study, and results are described in more detail in “A method for determining the optimal delivered hydrogen pressure for fuel cell electric vehicles” in the journal Applied Energy, Volume 218. Several areas of research regarding optimal DHP remain. One is the possibility of using different DHPs within individual refueling stations. It is conceivable that station owners would opt to provide a mix of higher- and lower-pressure hydrogen dispensers at stations and charging consumers based on DHP. Fuel cell vehicles have many potential benefits, and a robust hydrogen refueling infrastructure will be essential for their acceptance in the marketplace. The HOP model is a useful tool that can help planners develop effective, cost-efficient strategies for deploying refueling stations to meet consumer needs. These findings are described in the article entitled A method for determining the optimal delivered hydrogen pressure for fuel cell electric vehicles, recently published in the journal Applied Energy. This work was conducted by Zhenhong Lin and Shiqi Ou from Oak Ridge National Laboratory, Amgad Elgowainy and Krishna Reddi from Argonne National Laboratory, Mike Veenstra from Ford Motor Company, and Laura Verduzco from Chevron Corporation.